MX5 is a cross-platform secure browser that has inbuilt premium features for free like password management, ad blocking, and auto form fill and cloud storage for saving the web page. It is a lightweight yet very fast browser. It eliminates the clutter for serious browsing users. Though Maxthon has support for extensions for extra features, an average user may not require any of those. This browser is available on all popular platforms including Windows, Mac OS X, Linux , iOS, and Android. The experience of Maxthon browser is standardized across all platform. This makes an easy choice for multi-device owners. Switching between devices is very easy due to cloud-backed storage for all user data and browsing history. Why Use A New Browser? I do not like to use the same browser for all my browsing since one size does not fit all. Many things are done better in one type of browser but not all. I am a blogger and like to open hundreds of windows and web pages for my research. Having just one browser makes it difficult to organize. One more browser means one more category to organize easily. MX5 core features support my web research needs very well, especially the web research part. I can easily save any page through its personal cloud feature and use that content later for writing my blog post. I need the browser to be much smarter. I do frequent content research and curation. This requires a lot of different activities such as creating lists, taking snapshots and sharing on social media. Most browsers have extensions, however, I prefer the ones that do it most efficiently. Maxthon is really good at saving content in the cloud and accessing them from anywhere. This makes it a preferable choice for all content curators. I like to use browsers with limited extensions since more extension means more crash. The thinner your browser better it is for its long-term performance. Third party extension often makes the browser unstable. Maxthon inbuilt features are sufficient for the most part of my work. I can work with it using very few add-ons, which are conveniently available for free download. There are many popular browsers around however Maxthon offers a unique proposition in one browser. Password management and cloud storage features are not available in any other browser. There are many free/paid extensions required to get these features in any other browser. Below YouTube video describes MX5 in simple language. Maxthon Mx5 is very simple to use. You can follow below steps to get going. Install the browser with the downloaded installer. Import bookmarks - MX5 has import bookmark feature to import bookmarks from any other browser. Speed is the most important aspect of choosing a browser. MX5 is blazing fast browser. I have compared it with Chrome and Firefox. The MX5 browser performs much faster as compared to both. Gestures are a delightful feature for faster browsing. You can do a lot many things on the same browser without doing multiple clicks or navigate through menu options. 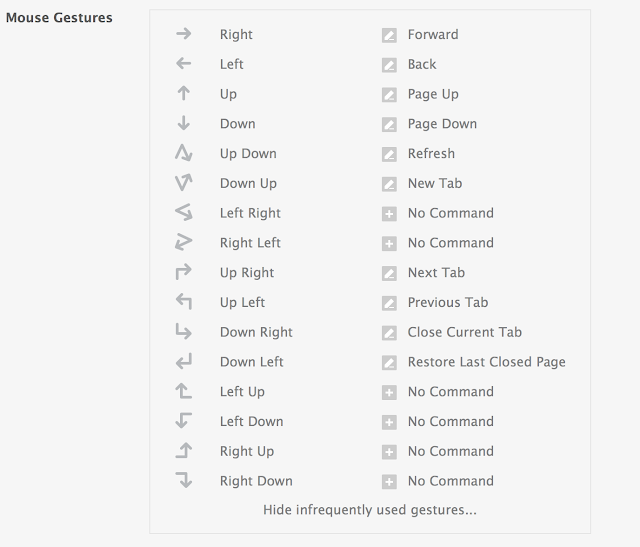 Maxthon browser supports various gestures to do frequent actions using quick touchpad commands. Below snapshot shows some gestures that are supported by MX5. You can also define your custom commands for these gestures. For people using the external browser, it also supports mouse gestures. 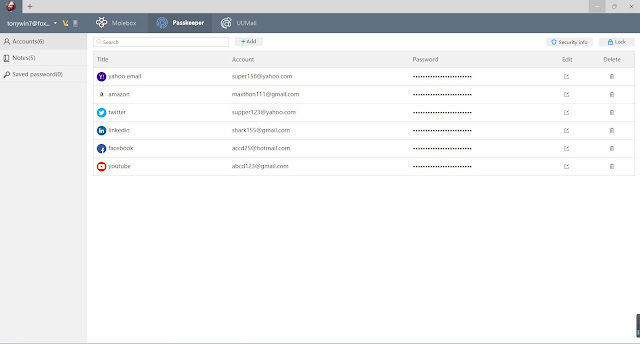 Passkeeper - the password management feature in this browser is my absolute favorite. This feature is absolutely free as compared to its competitors like LastPass, 1Password, and iCloud Keychain. Most people think that LastPass is free. However, it's missing a key feature in the free version. It does not allow "Unlimited sync across all mobile & desktop devices" in its free version. I think this is a must-have feature for the current era with multiple device ownership. 1Password is not free at all. They offer a 6-month free trial followed by a monthly subscription plan. iCloud Keychain is a completely free solution provided by Apple to securely store your passwords and sensitive information from all Apple devices. It works absolutely great for all Apple devices. Unfortunately, it only works on Apple devices. You can not use it on Windows, Android or any other operating system. On the contrary, MX5 is available absolutely free on all platforms including mobile devices, therefore, you can keep all your devices in sync with this. 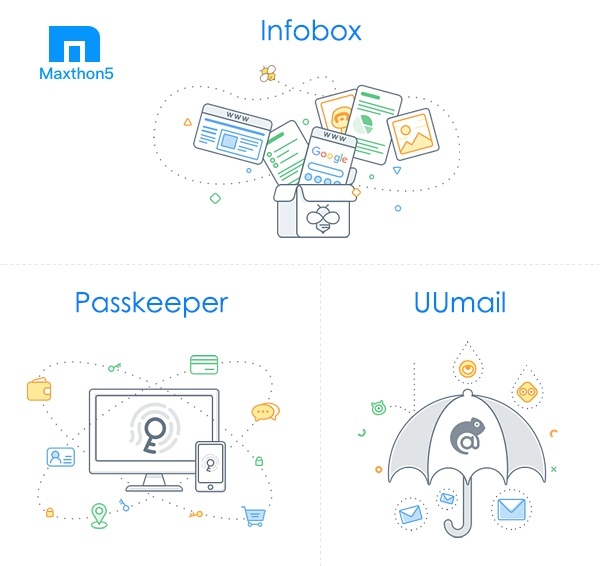 All user browsing information can be conveniently saved in Maxthon personal cloud. This enables users to seamlessly browse on multiple devices without losing their history or favorite websites. The cloud also supports backup option to ensure you do not loose your data if you lose a device. Maxthon also supports cloud backup of your downloads. This allows you to access these downloads from any device. There are many other personal cloud solutions, However, Masthon personal cloud can be compared with Apple iCloud for a lot of features. Device history backup is common for iCloud users however if you are not using an Apple device you can rely on Maxthon. The Infobox feature in MX5 is not present in any other browser. 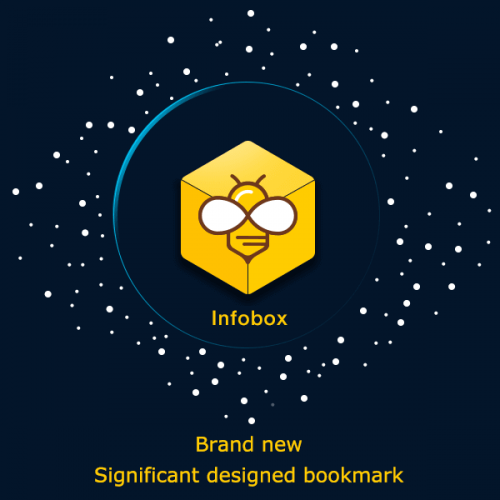 Just like Evernote, the Infobox feature allows you a free cloud storage for your favorite content and web pages. I have used Evernote and it's really nice for taking notes and accessing anywhere. However, it may require you to use an addon in existing browser. Maxthon Infobox feature completely eliminates the need of using Evernote. 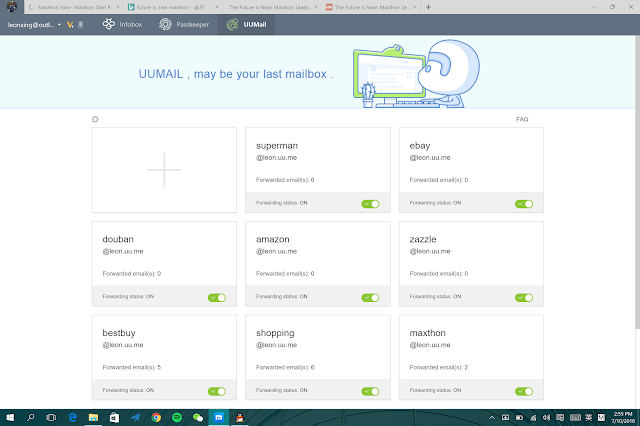 UUMail is your personal virtual box for emails. On Maxthon, you can have unlimited shadow emails. This feature allows you to have multiple email alias that will be combined in one mailbox. It also helps you stay protected from spam. UUMail shadow email feature is ideal for trial account signups where you are not sure if you will really use this account. For example, you can create an email address alias called “trial.myemail@example.com” and use it for all trial sign ups. However, you need not log into this email account separately since all your email will be routed to the same account. Maxthon has an inbuilt feature to grab the screen. This feature is extremely useful for bloggers and content curators. You can do your topic research on your mobile device while you are waiting for your train. 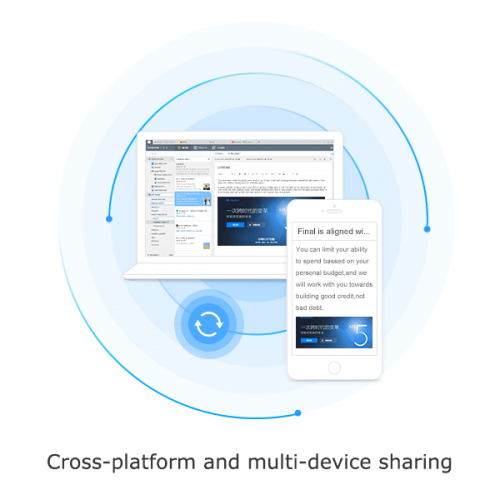 The screen capture is also backed by the power of cloud so you can share anything you capture on any device. I have found many screen capture software on different devices. However, none of them are available on all platform. Maxthon's multi-platform availability makes it a significant feature. The Maxthon browser is powered by Cloud browser engine C4. This engine is the core platform that fuels cloud and security features in Maxthon browser. This engine ensures unified user experience. Changing the browser is not an easy decision for regular internet users. It takes a lot of learning to get adapted to a different software. At the same time, you can not stay productive at your work if you do not use the right tools. Web browsers are important tools for our daily internet experience. HTML5 evolution has completely changed the power of web browsers. Maxthon browser is just the beginning of next era. Once you start using it you may use it for many different reasons. In coming decade, almost all browser will follow the footsteps of Maxthon. It's difficult to predict which browser will succeed in the long run however Maxthon has clearly got an edge over all other competitors. Share your experience with us in comments.